Is There Any Trouble If You Use a Formula In The Diet For Your Breastfed Baby? How To Recognize That Your Baby Needs Supplements? So Which Formula Are The Best When You Want To Feed Your Baby? Should infant get fed by breastfed, formula-fed, or both? It is still quite a hard question for anyone about to become a mother. In this article, I will show you some tips so that you will know if your baby needs breastfeeding or any other supplements. And the best formula breastfed babies will also be revealed, so read on to know how to raise your children smart and healthy. It is entirely safe if you supplement your child with formula. There are plenty reasons why mothers choose to use it. Many of them have to go back to work but they still not yet want to wean their baby. Others decide to supplement because they don’t have enough breast milk for their baby to grow healthy. No matter what reasons mothers may have, feeding with formula is good but can never be compared with breastfeeding. Although formula can provide nutrients for your infant, it does not have enough all the factors that assist his immune system. So he may catch some unwanted illnesses. Therefore, breastfeeding combining with formula-feeding can be an optimal choice for mothers who need supplements. Does Using Formula-Feeding Along With Breastfeeding Affect My Milk Supply? The answer is yes, but just a little. Your breast milk supply depends on your baby’s demand. So if your child asks for less nursing, your breasts will produce less milk. If you don’t use formula regularly (about one or two bottles per week), your breast milk will almost not be affected. However, if the amount is more (one formula-feeding per day), your breast milk will reduce. To solve this problem, you can pump your milk and put it in the fridge for freezing so that you can use it later. In this way, you will have a bank of breast milk for your baby along with formula. You can still keep your milk supply frequently even when your child is formula-feeding. He or she loses weight more than the usual amount. Babies usually lose about 10 percent of their weight after being born for the first five days. After that, they will gain weight again, and it needs two weeks for them to have the same amount equal to their birth weight. If your breasts still feel wet or not empty after feeding your baby, it could be a sign that he does not take enough milk. After the first five-day-old, your baby has fewer than six wet diapers. Your child cries or sleeps most of the time. If you see any of those signs, take your child to doctor for further health care. This formula is excellent for creating a baby’s natural defenses. The immune system is always one of the most prominent actors keeping your infant safe. When he knows how to crawl, it is even more crucial. Enfamil will protect your baby from harmless factors, support defenses, and milestones, and nourish his brain. Besides, it has the amount of choline and DHA, which are the closest to breast milk. Therefore, it can provide your kids with energy slightly equal to breastfeeding. There are various reasons why Vermont Organics is good for your infant. It provides an enormous amount of nutrition, DHA, ARA, and Choline. It also meets FDA standards and can be trusted when using to improve your baby’s health and help him grow much faster. 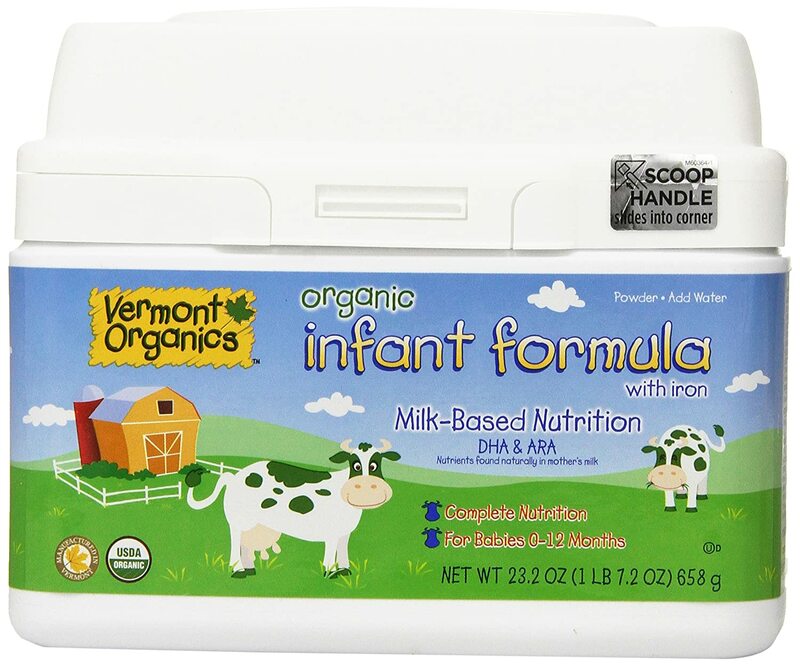 Manufactured by Perrigo Nutritionals, which has more than 30 years of experiences in producing the formula, Vermont Organics is one of the best choices when your want to supply your baby. There are two types for you: organic milk formula and organic soy formula. Remember to read each one typical use before buying. This product contains the best fatty acids that are good for your baby’s brain, including LGG, omega-3, and omega-6. They have been proved to have beneficial effects on baby’s eye and brain development. 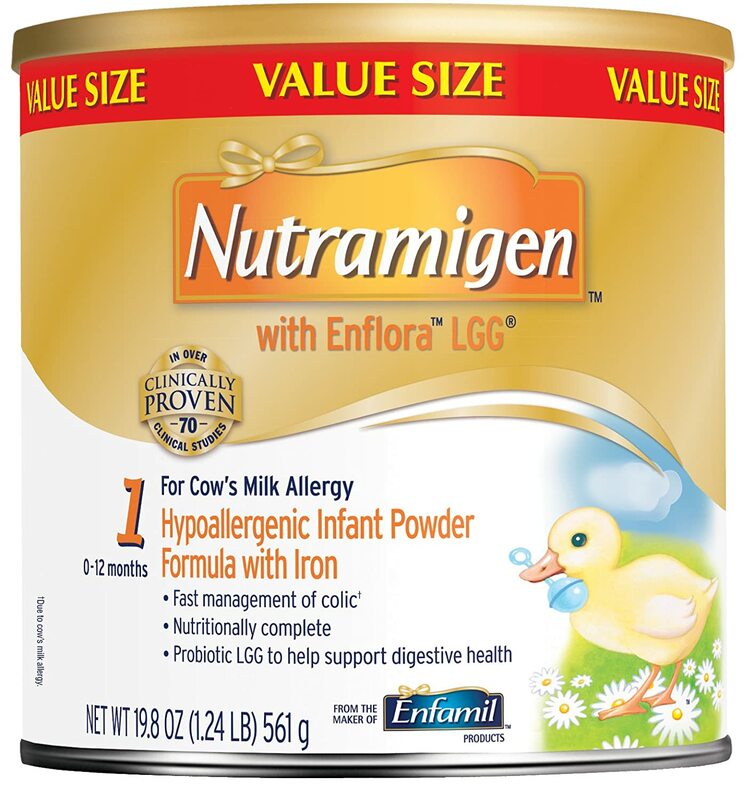 Moreover, Nutramigen is also recommended for infants having issues with numerous allergies. If your child has reflux, constipation, skin rashes, gas, diarrhea, or wheezing, he may have caught some cow’s milk allergies. And Nutramigen is the first formula which is particular for infants having those illnesses. One of the most important factors for a baby’s growth is vitamins. However, he usually lacks it for many reasons. This one provides not only a significant number of nutrients but also a lot of vitamins, which can assist your baby’s growth. 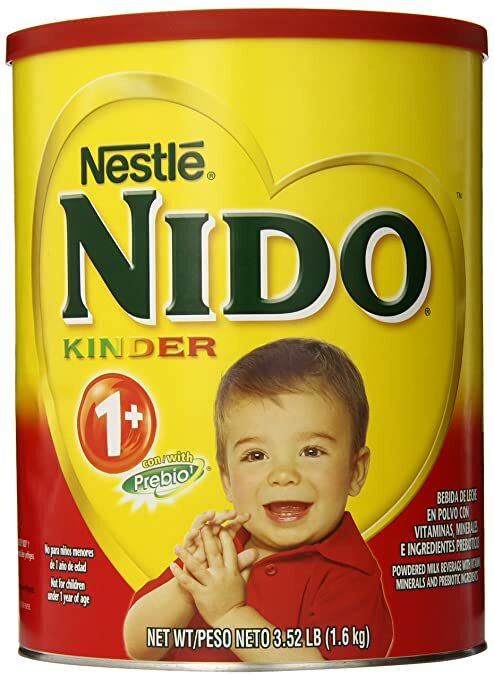 And NIDO has a lower price than other formulas, so it is more comfortable for you to purchase. It can also be mixed and processed with baby cereals and many types of smoothies. A note for you is that this formula is not recommended for children under one-year-old. Your baby is growing, and he needs critical factors to help him enhance both strength and wisdom. This formula is the best one to do that. It contains numerous types of nutrients, including DHA, iron, calcium, vitamin D, zinc, and 19 other ones. All of them can assist your infant’s brain development and support his growth. 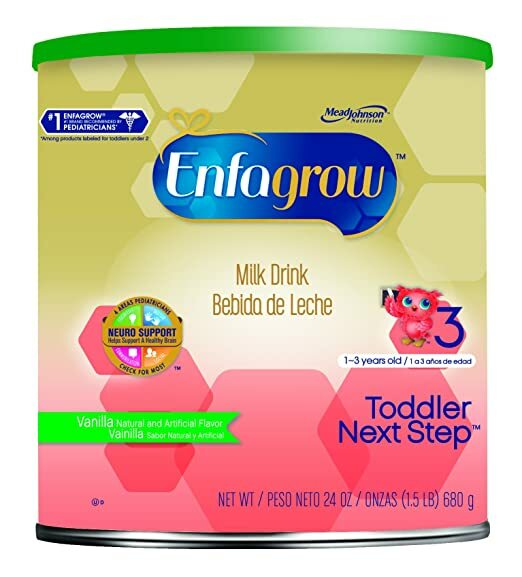 This formula is especially for babies from 1 to 3-year-old and available in vanilla flavors, which most babies like. So your kid will love it. Those are some tips and best formula breastfed babies that I would like to recommend to you. Keep in mind to test your child’s condition by going to the hospital to see which one is the most appropriate for him when he needs formula-feeding. And check the expired date on the formula’s label to make sure that it can still be used. Lastly, thank you for reading our article about best formula breastfed babies, and we hope that you will have the wisest choice to protect your child’s health and growth. Graco Pack ‘n Play Playard with Reversible Napper and Changer Review. Your Ultimate Buying Guide for Best Pack and Play. Best Humidifier For Baby Reviews. Honeywell Germ Free Cool Mist Humidifier Hcm 350 Review. Tips For Choosing Best Pack n Play. The Baby Whisperer’s Sleep Method. Types and Reasons Why Should Use Reusable Diapers. How To Keep Your Baby Healthy During Winter. Best Baby Bouncer 2017: Types, Benefits, and Buying Guides. Thank you to Mila Familea for writing this guest post today, Mila Familea is a dietitian pediatric specialist and collaborators for Passionmommy.com. She has been working in Africa, where nutritional deficiency is a serious illness for kids, for three years until now. Seeing how much nutritional deficiency can affect a baby, she usually writes articles and publishes them on her blogs to share practical experiences in taking care of infants. Her blog has a large number of viewers, most of whom are parents.